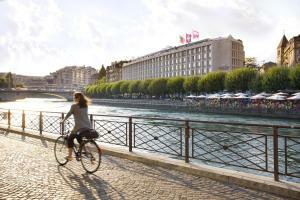 The luxurious Mandarin Oriental hotel is located on the right bank of the Rhone river, only a few minutes away from Geneva’s financial institutions, premier shops and galleries. The refurbished interiors are superbly stylish, preserving the fine Art-Déco details, but above all business and leisure guests enjoy Mandarin Oriental’s legendary service. The Mandarin Oriental will definitely become a landmark when it comes to gourmet cuisine in Geneva, introducing 2 new restaurants. Both are designed with cosmopolitan elegance by the acclaimed designer Adam Tihany. The inventive Rasoi is the fine dining restaurant serving tasty Indian cuisine by London-based, Michelin awarded Chef Vineet Bahtia. In June 2014, the Café Calla was opened by Chef Nasser Jeffane, offering a mix of modern Swiss, French and healthy cuisine with local and seasonal products. Beside the organic dishes, guests can also enjoy an extensive choice of beverages, cocktails and wines from the Geneva region. The hotel features a fitness centre, open 24-hours per day, as well as a new beauty studio.